Bel Canto singing of Vancouver Opera's Lucia di Lammermoor is stunning! Wow! Classical Italian opera at it's best with bel canto singing, and lavish sets with projections! Don't be late to this opera! With stalls on the Lion's Gate Bridge, traffic re-routed to Ironworkers Memorial Bridge, and traffic on the Georgia Viaduct backed all the way to Main St. – I very nearly missed getting seated. The set is dark. The overture begins. Flashes of lightning(?) illuminate the main characters of this tragic love triangle. And an electric current runs through the audience. At that moment, there is no place on earth I would rather be. A group of guards search for an intruder in a forest. 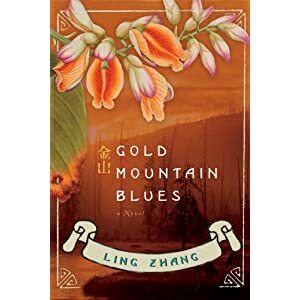 A young woman named Lucia secretly meets with the hunter. Meanwhile her brother, the castle lord, wants to marry her off to save the family's failing fortunes. Lucia and Edgardo declare their love for each other, even though he is the sworn enemy of her brother. 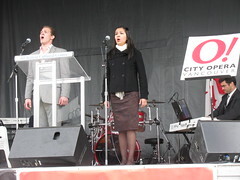 Eglise Gutierrez, the brilliant Cuban-American coloratura soprano, is Lucia to Michael Fabiano'd Edgardo. Her first aria, set in the forest, is a showcase of trills and runs that make the lyrical beauty of bel canto opera so popular. The opening night crowd gladly gave a lengthy applause to her solo. The singing of all the leads is very strong, and reaches a climax in Act II after Lucia is married to the hapless Arturo (Thomas Macleay). Six singers simultaneously voice their own ideas of the consequences of Lucia's wedding to a man she doesn't want to marry, who is thinks she is wonderful, arranged by her brother, with comments by the priest and her attendant companion, while her objet d'amour interrupts the wedding too late. Wow! Six part harmony! And the sets are absolutely gorgeous! The forest scenes are densely layered with projections on the scrim screen. The castle scenes reveal a background of a vertical view of castle walls and ramparts. Welcome to the Vancouver Opera's 2010 production of the 1835 Donizetti opera, Lucia di Lammermoor, set in early 18th Century Scotland, on the Scottish Lowland marshes of Ravenswood Castle. It is one of the most popular operas, making it's 6th appearance as a Vancouver Opera production since 1966. It could be popular because of Vancouver and BC's deep Scottish roots, but there was not a kilt to be seen on stage, since the setting is in the lowlands of Lammermuir Hills – East of Edinburgh. Donizetti based his opera on the historical novel by Sir Walter Scott, The Bride of Lammermoor, which was based on a true story of the Dalrymple Family in 1669, when a groom met a wedding night tragedy, and the bride never recovered from the trauma. And thus, one of opera's most famous scenes and arias was created. 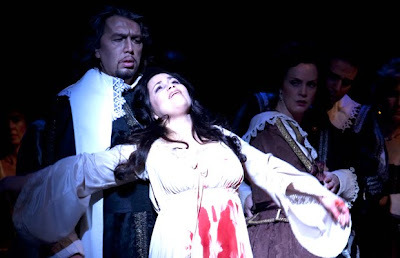 There are dozens of youtube videos of “The Mad Scene” for Lucia Di Lammermoor, debating the merits of certain singers. But on the Queen Elizabeth stage only one mattered. Gutierrez moved thoughtfully and held the audience's rapt attention. Standing Ovations for Guiterrez at the end of the evening. This is supposedly a deep psychological opera, about the misguided family dynamics, and the tragic deaths of three innocents. But it could also be compared to Romeo and Juliet, because of the feuding families. A simple boy meets girl, others try to break them up, girl thinks boy betrays her, so she runs the other way, and 1st boy tries to get girl back, but has consequences. Oops, maybe it it's more complicated than I thought. But in our sophisticated 21st psychological reasonings, we must remember that Lucia and Edgardo are likely teenagers. Their infatuations and rash actions could also be likened to a Glee plot on television with terrific singing scenes, but with tragic consequences more akin to the “I know What You Did” horror series. Vancouver Opera website is very interesting. You can find many weblinks to information about Lucia Di Lammoor on the Vancouver opera website. One of my favorite perusals is the anime cartoons done for many of its operas. There is even a Vancouver Opera youtube channel. These are videos of the rehearsals and set concepts. Don't watch them if you want to be surprised. But do watch them to be better prepared for when you do attend. Setting the scene for Vancouver Opera Dec 4-11, 2010. A teen-aged Walter Scott, met the rising Scottish poet Robert Burns during the winter of 1786–87, at one salon gatherings where Burns would have given a reading about the time his first book Poems, Chiefly in the Scottish dialect was published. There is a quote wrongly attributed to Burns “Opera is where a guy gets stabbed in the back and instead of dying, he sings“. While this quote very aptly describes the death scenes in Lucia Di Lammermoor, I could find no references of this quote on official Burns websites. But I did find it referenced to American comedian/actor Ed Gardner, which makes more sense. Burns usually wrote in the Scottish dialect, where the term “guy” is more usually found as a name “Guy”. There are 9 operas that are set in Scotland. The most famous two are Donizetti's Lucia Di Lammermoor, and Verdi's Macbeth. Rossini's La donna del lago (The Lady of the Lake), which was the first Walter Scott novel to be adapted to opera, has not been performed in Vancouver. While Vancouver Opera has produce Lucia di Lammermoor 6 times, and Macbeth only once, VO seems to have a love affair with certain operas set in China and Japan, as Turando has been produced 4 times, and Madam Butterfly 9 times. Count for yourself on Vancouver Opera's Production History. This entry was posted in Commentaries, Main Page, Multicultural events, Music, Scottish, Gaelic, Irish Celtic events and stories, Theatre on December 7, 2010 by Todd. Everybody's Italian on Commercial Drive for Italian Days. I saw this fellow singing and playing electronic accordion. I want one! Wonderful singing in Italian from Italian operas – I want to bring my accordion and return next year with some Asian Canadian musician friends and perform our repertoire of Italian songs and arias. We could call ourselves Ital-Asians Romanza! 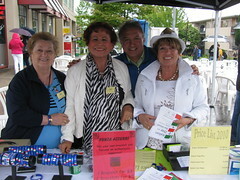 Mike Lombardi, Vancouver School Trustee and Library Board – with some of the volunteers from the Italian Cultural Centre. 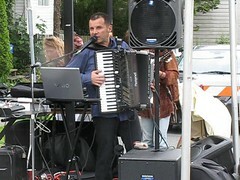 I once played O Solo Mio on my accordion for Mike. He loved it! 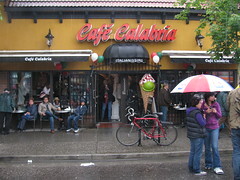 One of my favorite places on the Drive for gelato and coffees. 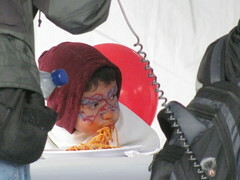 There was a pasta eating contest. This little fellow got great mouthfuls… but he didn't win. 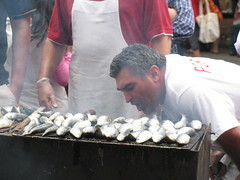 Outside the Portuguese Club, they paid special attention to the bbq herring. 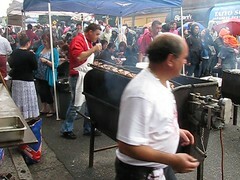 But the line-up was longer for the bbq roasted half-chickens – check out this video. Not everybody is DNA-Italian – but the Asian restaurants, Greek places, and even the Caribbean restaurants all go in the action. 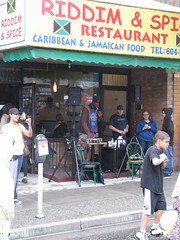 Here is a DJ and sound system blasting reggae tunes. 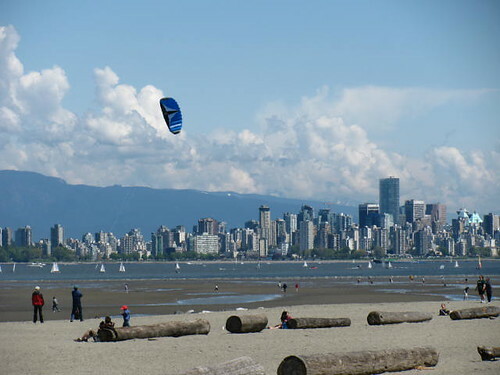 This entry was posted in Commentaries, Food & Restaurants, Main Page, Multicultural events, Vancouver Area Adventures on June 7, 2010 by Todd. Ali & Ali 7: RCMP, Immigration and tasers – Oh My! at the absurdity of our history and culture. But in today's world, Wayne & Shuster, comedy kings of the 1960's and 1970's, have given way to Kids from the Hall, and Russell Peters. Canadian culture is no longer white and red, our cultural diversity includes black and yellow and pink and especially brown. Canadians also come from Iran, Iraq, Lebanon and Azerbaijian. Wayne & Shuster used to make fun of foreign accents. Camyar Chai and Marcus Youssef as brown immigrant refugees from the fictional country of Agraba, take ethnic jokes to a whole different level – but with some very serious political commentary. 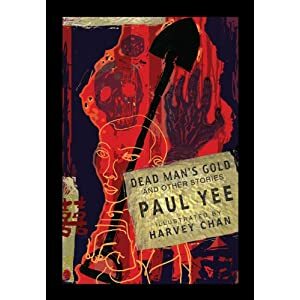 published play Ali & Ali and the Axes of Evil. I couldn't stop laughing at some of the bits about Asian Heritage Month, and the Scottish stage manager. For the 2010 Gung Haggis Fat Choy Robbie Burns Chinese New Year Dinner, I had invited Marcus Youssef to read/perform an excerpt with comedian Charles Demers. So I wasn't going to miss them. The show opens with a montage of current world leaders from Libya, USA, and Canada. It's a tribute rap to Moammar Gadhafi. Wow… we are definitely in a different cultural perspective here. The play is interactive with the audience, asking questions, getting responses. Surprise! They are spoofing and utilizing experimental theatre audience participation as well as Bertolt Brecht's agitprop theatre. Ali & Ali are presenting a show to the audience. They introduce their assistant as Yogi Ru, in actuality Vancouver actor Raugi Yu. Raugi is the straight man to this zany duo, even dressing up as Obama's Portuguese Water Dog. World Order. The puppet show took on a weird outrageous vibe, as talking heads of Afro-American movement cultural icons, criticize Obama policies in the White House. It would have been nice if they had been able to identify who their “Jiminy Cricket” conscience guides were, as many audience members are probably not versed in Afro-American revolutionaries such as Malcolm X and Angela Davis. prison detention & torture, illegal immigration and deportation. This show uses the slap stick humour to set up and explain the underlying social commentary. How does a normal human being cope with being detained in prison on unspecific charges? The balance between the serious and absurdist swings back and forth, eliciting emotional reactions from the audience. Sometimes it works, sometimes it doesn't. There are many in-jokes, dependent upon the audience's knowledge of many things. It is like a television channel-flipping barrage of issues. But the play succeeds in informing the audience about our country's detention of prisoners, and it creating new cultural perspectives of multiculturalism. Sometimes, how you see the world really does depend on what colour your eyes are. Definitely not for everybody – but neither was Monty Python or Wayne & Shuster. 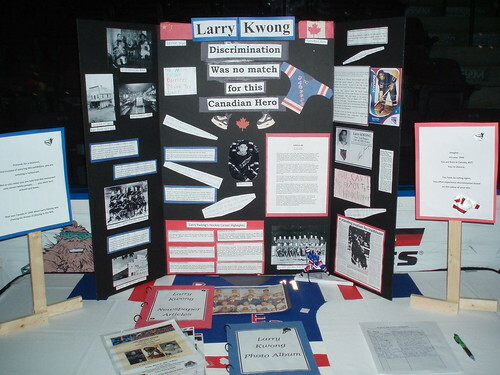 This entry was posted in Canadian Identity, Canadian Identity & Heritage, Commentaries, Cultural Fusion, Literary Events, Main Page, Multicultural events, Recent Reviews, Theatre, Upcoming Events on April 23, 2010 by Todd.